The beginnings of Breitling's success story sound like a picture book: In 1884, the Swiss Léon Breitling opened a factory for precision timepieces in the Kanton Jura. His chronographs were equally popular in industry, science and sports and even found military use. Breitling convinced with high quality standards and classic design. Within a few years, the brand was so successful that another factory was opened in La Chaux-de-Fond. In 1889 Breitling patented a classic model with a slim design. Thanks to low maintenance and streamlined production, it became very popular. 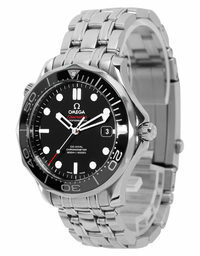 4 years later followed the patent for a movement which was for back in the days, unbelievable 8 days power reserve. 1896 was followed by another milestone: Breitling developed a chronograph, which went an accuracy of two-fifths of a second. 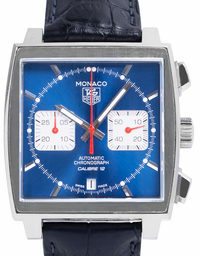 After automobiles had become the preferred way of transportation, the brand followed the trend with the development of a model equipped with tachymeter function. In addition to motorists, however, policemen were now able to measure travel speeds without any problems. A short time later, the first speeding tickets were issued in Switzerland. After León Breitling's death in 1914, his son Gaston followed in his footsteps and continued with enthusiasm and pioneering spirit. But the history of the manufacturer wasn´t an uninterrupted success story. In the late 1970s, Willy Breitling struggled with health and financial difficulties. The company was hit hard by the "quartz crisis". Since his sons were still very young and the future of the industry was uncertain, Breitling decided to sell it to the entrepreneur and passionate pilot Ernest Schneider, who brought a new spirit into the company. Through his effort Breitling was one of the few luxury watch brands to maintain its independence from large luxury groups such as the e.g. Swatch Group. After rescuing Breitling began experimenting with regular quartz movements and multifunctional special models such as Aerospace and Emergency. As interest in mechanical watches grew rapidly in the 1990s, the classic Navitimer also celebrated its well deserved comeback. 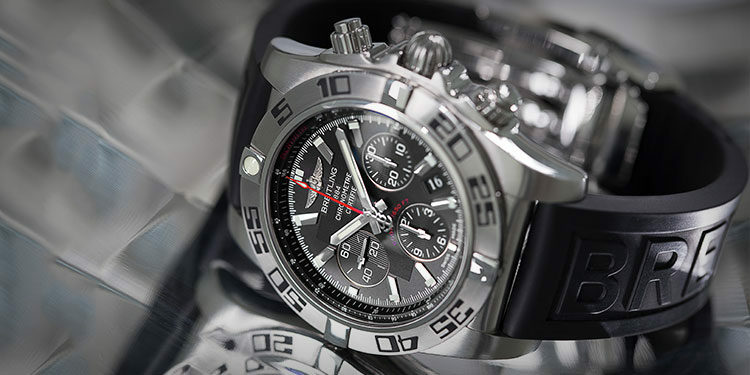 Breitling has been synonymous with luxurious watches with a distinctive design for over 150 years. The company owes its popularity to its close relationship with aviation. This is already indicated in the logo: The B with the side wings. Their close connection began in 1915, when Breitling published a groundbreaking invention that pioneered the evolution of stopwatches. 11 years earlier, Cartier had created the first aviator watch with lather strap for aviation pioneer Alberto Santos Dumont so he could read the time during the flight; Breitling extended this invention with a stop function. The wrist chronograph proved to be enormously useful for pilots and soon gained huge popularity. In 1915, Breitling gave it´s stopwatch another push button. 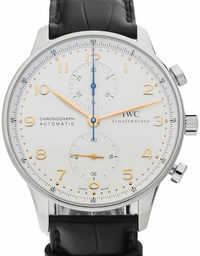 The double button structure is now a matter of course for us, but to date stopwatches have been operated via the crown. By introducing the two control buttons Breitling set standards that have been maintained until now. After the sudden death of Gaston Breitling in 1927, the company was managed externally for 5 years until his son Willy was old enough to take responsibility for the family business. 1936 Breitling became an official supplier to the Royal Air Force (UK), followed in 1942 by the US Air Force. The "Chronomat" presented at that time also had a slide rule in addition to the chronograph and already gained great popularity under the flying personnel. The big breakthrough succeeded the Swiss watch company, as it published 1952 its success model, the "Navitimer" (an abbreviation for "Navigational Timer"). With their slide rule built into the bezel, pilots could easily perform all calculations relevant to their flight plan - a tremendously valuable help before the electronic onboard computer was invented! 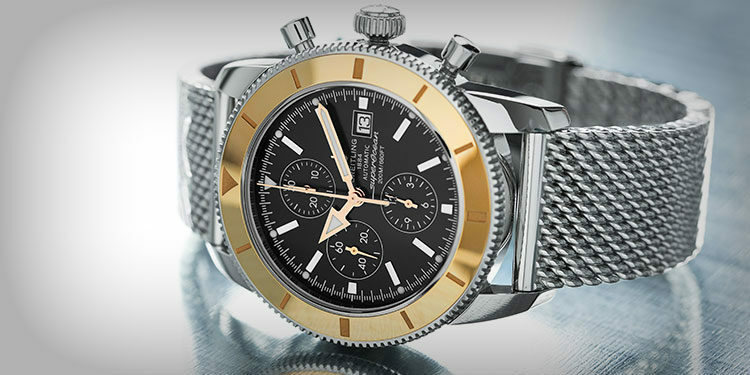 In 1961 the Breitingling SA also made ties to space when astronaut Scott Carpenter asked for a one-hour, 24-hour display. Breitling followed his request and created the Navitimer Cosmonaute, which Carpenter used in a 352-day spaceflight. Due to Breitling's story, it is not surprising that many famous astronauts and (hobby) pilots own a watch of the brand - Buzz Aldrin, Mark Kelly and John Travolta are just a few of the best known examples. Breitling also enjoys enormous popularity with Hollywood stars: Tom Cruise, Russel Crowe and Forest Whitaker, for example, have an emergency, Harrison Ford names an aerospace, and Leonardo DiCaprio has a Chrono Avenger in his collection. Slightly less known is that Breitling watches are also widely used among musicians. Miles Davis, Serge Gainsbourg and Peter Hook (New Order / Joy Division), have Navitimer variants, while Bob Weir (Grateful Dead), Axle Rose (Guns'n'Roses) and Lou Reed were sighted with a Aerospace Model. But not only male celebreties are sporting Breitlings on their wirsts. 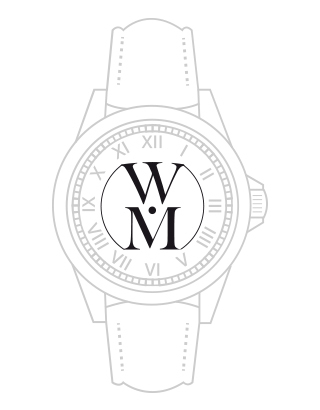 Celine Dion owns a ladies version of the Chronomat with a so called mother of pearl dial. In terms of sponsorship, Breitling focuses on aerospace as its design, but has already funded many exciting projects. For example, the Breitling Jet Team, the largest civil aerobatic team in Europe, is world famous. The sponsorship for the projects of the inventor of the Breitling Jet Team, Yves Rossy, who always makes himself talked about with homemade jetpacks caused some sensations as well. Breitling was always a great example for excellent quality and precision. This is also reflected in Breitling's resale value. 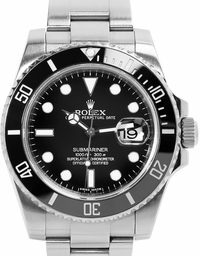 Watches of the swissmade brand experience almost without exception a price increase, which makes them a considerable investment. The stainless steel version of Breitling Navitimer, for example, experienced an increase in value of 172% between 1996 and 2016 - which, with good care, can add up to several thousand euro. The philosophy behind Breitling's assortment is simple but proven: Create watches that match the needs of pilots to the highest possible degree. 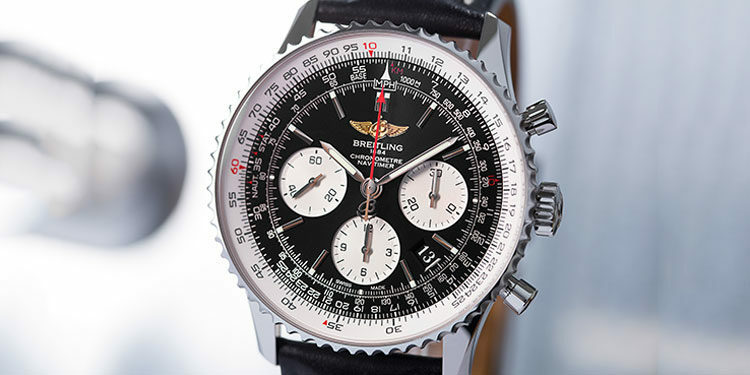 In addition to the slide rule of the Navitimer, Breitling has designed numerous innovations that offer great additional value, especially for flying personell. For an example, in the event of a crash, the Breitling Emergency is equipped with an emergency transmitter, which can send an SOS signal to rescue personnel. The "Haute Horlongerie", however, Breitling has practiced only rarely. There are hardly any models with complicated complications, and there is only a single model with a tourbillion available - the Breitling for Bentley Mulliner Tourbillon with a proud six-figure MSRP. Like Rolex or Hublot, Breitling has found a consistent design language that is distinctive and easily recognizable. Typical style elements are the chronograph display with 3 totalizers, the dark brushed steel and the distinctive dials with large numbers and line indices. Together, these elements give a dynamic and masculine appearance that sends out an adventurous aura. Unlike many competitors, Breitling remains faithful to this style in women's watches, though a little smaller and more understated than Breitling's men's watches. This functional approach has paid off. Meanwhile, the name Breitling is known worldwide and also popular far beyond pilot circles. The Navitimer is considered the absolute classic among the pilot's watches and was for a long time a bestseller among pilots. Above all, this popularity is due to the fact that it was perfectly adapted to the needs of this target group. With its large dial, it is easy to read and with the built-in slide rule in the bezel flight data could be calculated before there was on-board computing possible. The Avenger II is designed to provide the highest level of ruggedness and reliability in all extreme situations. Although their design follows Breitling's pilot's watch style, all of them provide the waterproofness of a diver's watch. With its large and bulky case, the Avenger II is popular with men who prefer masculine and distinctive timepieces. Designed as a professional diver's watch, the SuperOcean series is so waterproof it can dive deeper than most modern submarines. 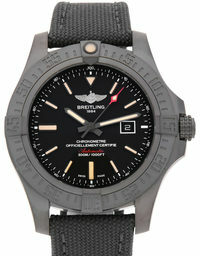 Although it also has the appropriate equipment (rotating bezel, helium valve), it remains true to the Breitling design. The 1942 presented Chronomat series was particularly popular with the US Army Air Force. It is hand-wound and slide rule one of the original models of Breitling. 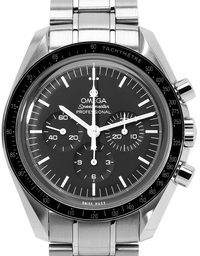 Its features enable mathematical calculation, which is reflected in its name - a combination of chronograph and mathematics. Colt models have their origins in the Colt Military, which, as the name implies, was designed for military use. 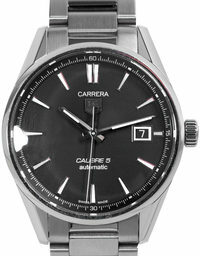 These roots can still be seen in the design language of new models such as the Colt Quartz A7438811. 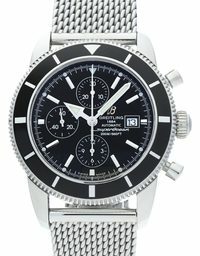 In our online shop you´ll find a large selection of used Breitling watches, vintage models in excellent condition and even sometimes new, never worn models. Watchmaster is a safe adress for the purchase of your desired Breitling watch: All luxury watches we sell are checked by us and provided with a certificate of authenticity. You have already chosen your favorite Breitling and would like to bring it home as soon as possible? 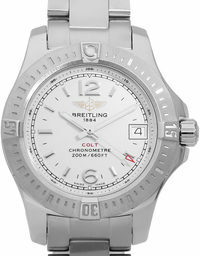 Pay your used Breitling watch easily and conveniently by credit card. 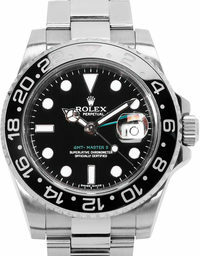 Alternatively, you can finance your watch as well. Pay the purchase price in small installments - an installment payment allows you to plan your investment for the long term. 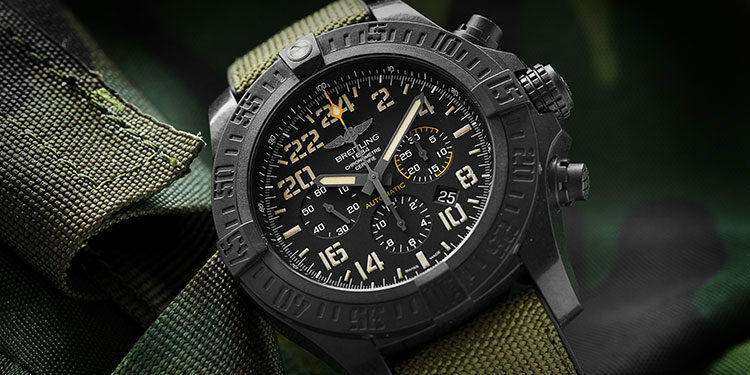 Find out on our website which payment option is right for you and buy your Breitling today. What is the Price of a Breitling watch?